France has always been a cultural trendsetter, from the architecture of Versailles to the fashions of modern Paris. French wine and other spirits hold an important place in the French cultural pantheon, and Charles Joseph Minard sought to map how they were manufactured and shipped across the country. Today’s map, the next in our ongoing “Mondays with Minard” series, shows the major land and water thoroughfares for wine and spirits across France in the mid 1800s. 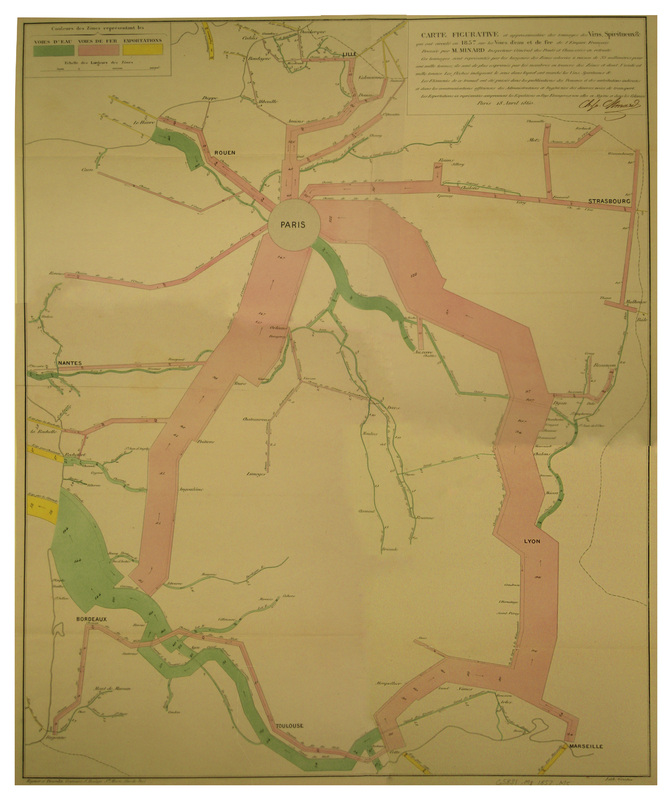 Minard plots land transport via railroads in pink, and river transport via boat in green. Yellow lines represent overseas exports. Minard drew each line to represent 100,000 tons for each 33 millimeters of thickness. Click here or on the picture above to see an enlarged version of the map. The map shows how clearly Paris was the nexus of the French transportation system. Most of the French-made wine and spirits were destined for consumption there, but even the little that was exported usually had to pass through the city before reaching its final destination. French rivers, particularly the Garonne, carried in large amounts of wine and spirits until they reached major cities like Bordeaux where they could be loaded on railroad cars for easier transport. The same phenomenon is visible with Rouen on the Seine. The map also shows how, even in an industrialized country like France, wine and spirits sometimes had to travel hundreds of miles down relatively small rivers until they could reach the first major node in the rail network. This is a post in our continuing “Mondays with Minard”series, exhibiting Charles Joseph Minard’s excellent cartographic handiwork. This map was photographed specifically for use here at Cartographia from the collections of the Library of Congress. Feel free to reproduce the map in any way you wish, but please cite us as the source. What i do not understood is if truth be told how you are now not really much more neatly-favored than you might be now.